Ebenezer Tracy was a carpenter from Lisbon, Connecticut, who specialized in making fine, hand-crafted furniture. 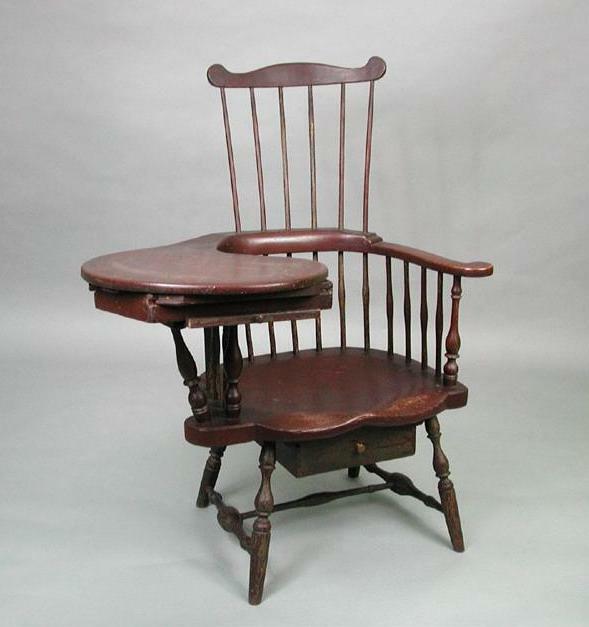 He not only became the preeminent Windsor chair maker in all of Connecticut but passed his skills on to his sons and son-in-laws, ensuring the succession of his unique artistic style. Today, the fan-back, sack-back, and continuous-bow armchairs and settees produced by Tracy and his family are some of the most sought-after furniture pieces of the late 18th and early 19th centuries. Ebenezer Tracy was born in 1744 and was a direct descendant of Lieutenant Thomas Tracy—an Englishman who settled Norwich in the mid-1600s. Ebenezer was a carpenter by trade who set up shop in Lisbon and began crafting some of the highest quality Windsor chairs of the era. (Though Windsor chairs include many stylistic variations, a defining feature is a solid seat to which the legs as well as the spindles for backing and, sometimes, arms are attached.) Tracy produced some of his finest works between 1785 and 1800, but he also helped ensure the legacy of his product through the training he passed on to the next generation of Tracy furniture makers. Three marriages resulted in nine children for Tracy, including three sons. The eldest son, Elijah, served as an apprentice under his father before opening his own furniture-making business on the family property in Lisbon. He inherited the property upon Ebenezer’s death in 1803 but sold it shortly after and moved to New York where he continued in the furniture business. Ebeneezer’s other sons, Ebenezer Jr. and Frederick, also became furniture makers and two of his daughters married men who specialized in crafting furniture. The most famous of these men was Amos Denison Allen of Windham, Connecticut. He apprenticed himself to Ebenezer as a young man and, at age 21, opened his own shop in South Windham and married Ebenezer’s daughter, Lydia. In addition to finely made Windsor chairs, Allen crafted sideboards, chests, secretaries, and desks that proved very popular. After Ebenezer’s death, the Tracy family seemed to scatter. Elijah moved to New York and the business fell to Ebenezer’s first cousin, Stephen Tracy, who ran the business in Lisbon with Ebenezer Jr. until 1807, when Stephen moved to New Hampshire. Ebenezer Jr., though still an excellent craftsman, never matched the level of expertise acquired by his father. He moved in with his sister Lydia in 1811 and passed away in 1822, essentially bringing to an end the era of success enjoyed by the Tracy family as furniture makers in Lisbon. Today, furniture pieces (particularly Windsor chairs) produced by Ebenezer Tracy and his descendents are highly-prized works of art sought by museums and individual collectors. Examples of the Tracy family’s furniture can be found around the world and at such prestigious institutions as the Connecticut Historical Society, Winterthur Museum in Delaware, and the Metropolitan Museum of Art.